Happy Wednesday! I am pleased to present you with another giveaway from Smiling like Sunshine sponsor Toyella. Toyella is an online retailer of beautiful children's toys, games and gifts with a groovy and bright style. They actively seek out European products that are not widely available in the UK. I fell in love with their gorgeous costumes and who wouldn't enjoy these art and creativity toys? Toyella has agreed to give one of you lucky readers one Goodbyn Lunchbox worth £19.99. A few weeks later, everyone will be back to school, so these will come handy. 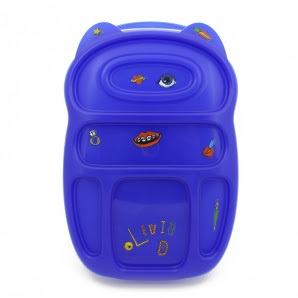 The Goodbyn lunchbox comes in two styles: Original (with ear tabs to help little ones to open the box), or Too Cool For Ears (for older children). Looking inside, it has separate compartments that seal when the lid is on so that you can put foods in without any fear of them getting mixed up. 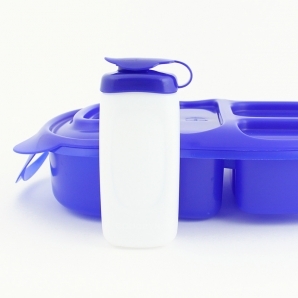 They also come with their own drinking bottle that fits in the box eliminating the need for separate bottles. It comes with lovely stickers so children can decorate it to their hearts' content. 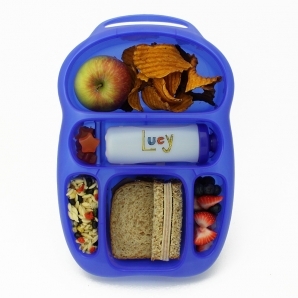 These cool lunchboxes are recyclable, dishwasher safe and most importantly free from BPAs and phthalates. The closing date for entries is 23rd August at midnight. The winner will be chosen at random and will be announced some time during the next day.The winner will be able to choose one size and colour. I've subscribed to Toyella's Toy Club - I really like the Cony hats and the Flip dolls. My son's would love them! I'm joined up to the Toy Club. Toyella have way too much cool stuff, but I'm really loving their pond yachts at the moment! Popped this link on my Facebook page too. I like the trunkis especially the Harley. My son would love one of these Goodbyn lunchboxes! There are some great toys here and really unusual things. Think it would have to be the trunki. I love the lunch boxes and also the soft toys. Theo cuddly tiger looks adorable! I've registered - like the look of the stuff on that site - have bookmarked for Christmas shopping inspiration! Love the Maxi Cuisine Play Set and also the educational toys - the sewing cards remind me of some I had when i was little! 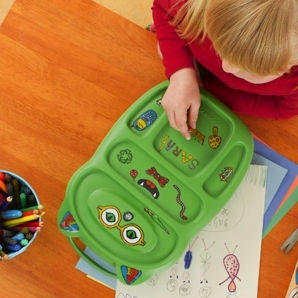 I love the maxi cuisine play set. Shared on my FB page (Carolina Johnson. I follow Smiling like Sunshine @smilinglikesuns and Toyella @toyella on Twitter (@pandcands). I've subscribed to Smiling like Sunshine via Google. I joined Toyella Toyclub, and I LOVED the monster jigsaw tin.